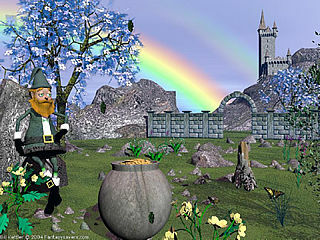 In the Irish Fables animated screensaver, the Wee People, rainbow, Irish Castle, pot of gold and shamrocks are all represented in this very colorful holiday accessory. This utility is supported by ocean associated sounds that can be muted. This shareware product has a two-day trial period then must be registered in order to continue working. This is a fantasysavers.com creation.